Posted on May 1, 2018 by Mike Sonnenberg Posted in Haunted Places, Houses	. The grand old home about a block south of downtown Mason is known as the Jewett Home. In the 1930’s the Jewett family converted it into a funeral home and operated it until the 1990s. I was told that it was not uncommon for early funeral parlors to be in a house where the family that owned the business lives in the house. That seems really strange to me to live in a house with dead bodies, but it was normal back then. 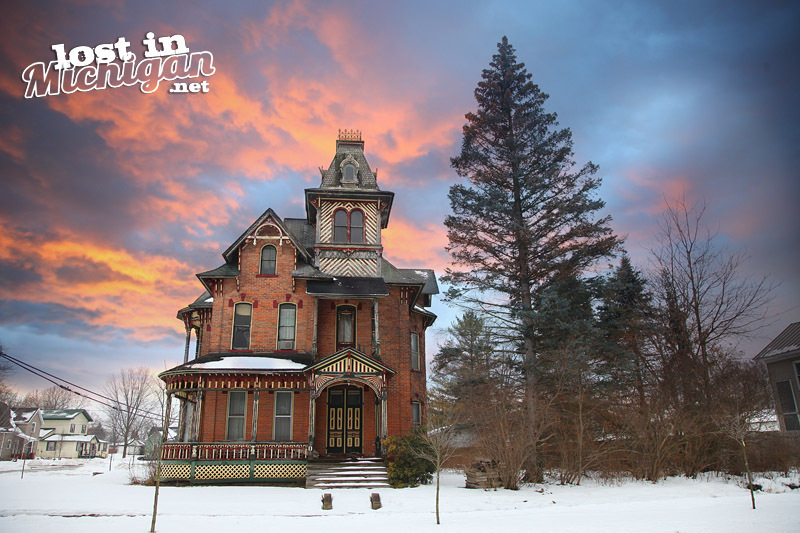 The house was originally built in 1855 by a wealthy developer, J.P. Coatsworth. Former Lansing Mayor Orlando Barnes once lived in the home and during the Great Depression, it was operated as a tea house. I wonder what kind of “tea” they sold during Prohibition and if there were spirits in the tea. It wasn’t until the Funeral home closed and the house was rented out when people who lived there have said they heard strange noises in the home. 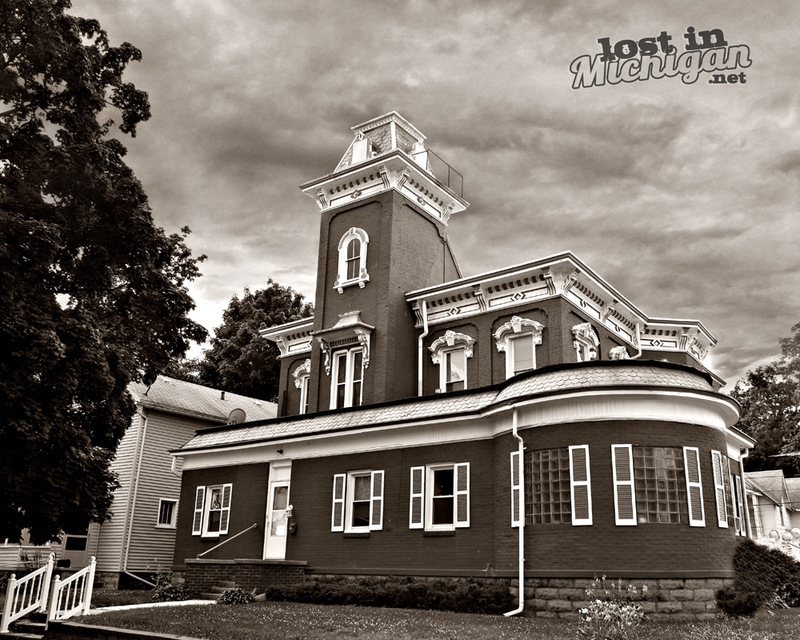 I am not sure if it’s haunted, but I am intrigued by the cupola on top of the roof. I wonder what the view is like from that little room. The house sold recently and is a private residence. Posted on March 15, 2018 by Mike Sonnenberg Posted in Haunted Places, Houses	. Narcissa Page (or Paige since I have seen it spelled both ways), owner of the Page House hotel in St. Louis, built this mansion in 1884. Her contractor, Mr. Leach, built Col. Elwell’s “castle” down Delaware Street at the same time. you can see my post about it HERE I read somewhere that the tower on the house was built so Narcissa could see her hotel from it. Mrs. Page’s daughter Lillian lived with her and she married George Charles who owned a drug store downtown and built the Charles Building. Sadly George passed away at an early age of 44 and soon after Lillian’s mother died at the age of 80 years old leaving Lillian to live in the house alone for almost 50 years. People think there is a tombstone in front of the house, but it is actually a carriage stone with the name Page on it. A carriage stone served as a stepping stone to help passengers as they climbed in and out of carriages and were popular back in the horse and buggy days of the 19th century. There are stories of the house being haunted and Susan Wood who lived in the house with her family was kind enough to message me about living there. She told that she never felt the house was “haunted” but she felt that Lillian’s spirit was still present in the house. “Locked doors opened and closed on their own, things would come up missing only to found in a totally random place a few days later, you could hear her moving up and down the massive staircase as the steps would creak.” The house has been vacant for years and the neighbors have said they have seen a woman in the window and have heard piano music come from inside the house. as far as I know, the house is still privately owned, so please do not trespass and be respectful, I know I should not have to say it, but there still are a few people out there that don’t think very well and do stupid things. Posted on October 15, 2017 by Mike Sonnenberg Posted in Haunted Places, Historic Places, upper peninsula	. In 1864, E. Gaynor built the Gaynor House hotel, which he renamed the Ludington House in 1871 after lumberman Nelson Ludington. 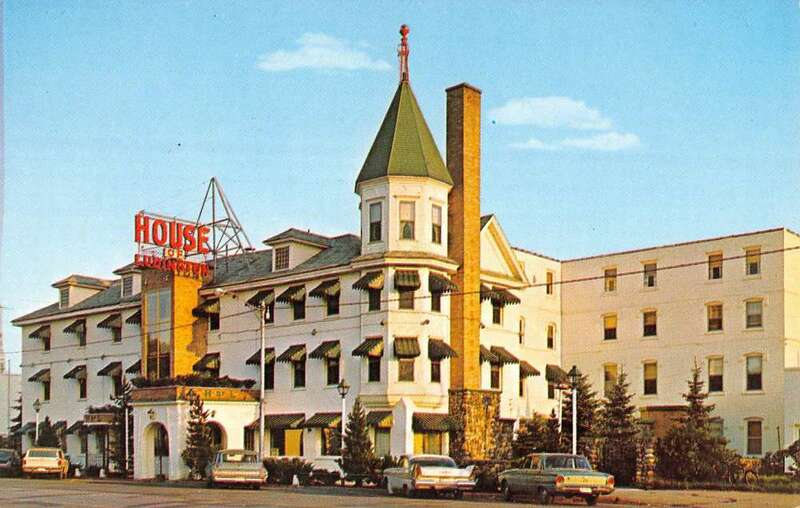 In the late 1800s proprietor John Christie enlarged the hotel and renamed the establishment the New Ludington Hotel. An advertisement in the 1893 Michigan Gazetteer and Business Directory read, “New Ludington Hotel – The Largest and Only hotel in the city having Baths, Steam Heat and Electric Call Bells – $2.00 per day.” The hotel exemplifies Queen Anne resort architecture, popular in the 1880s and 1890s. As with any large old structure, there are rumors of ghosts the reside in the historic building. they say they are friendly and like to play with the elevator controls and some people have claimed to see them in the hallways. I don’t know about spirits roaming around but I can imagine over the years many travelers, tourists, and business professionals staying at the hotel enjoying ” Pure Michigan”. They don’t make hotels like it anymore most new hotels are rather bland and boring, sure you get a nice room and a place to sleep but it would be nice to stay somewhere the accommodations are part of the adventure and not a break from the journey. I saw that the owners of the hotel retired and recently sold it to a developer who is planning on converting it into housing for seniors. 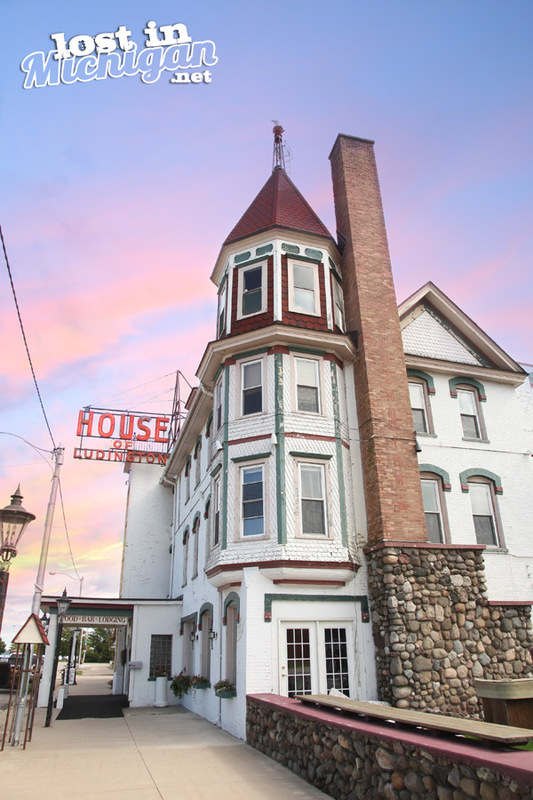 Although I will not be able to get the chance to spend a night in the old hotel at least the new owners seem to be committed to saving its historic features. 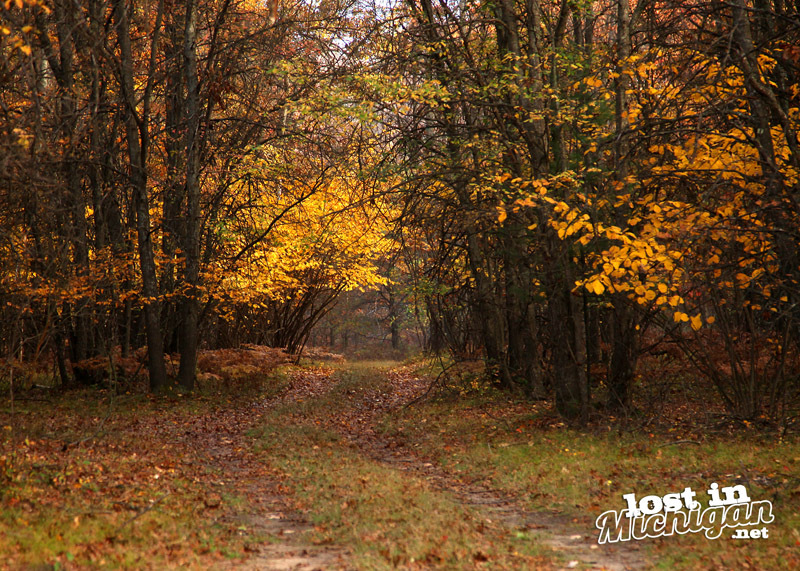 Lost In Michigan Books and Calendars are on SALE this weekend. they help me with expenses to do this website I hope you will check them out HERE. Posted on October 14, 2017 by Mike Sonnenberg Posted in Haunted Places, Water Tower	. 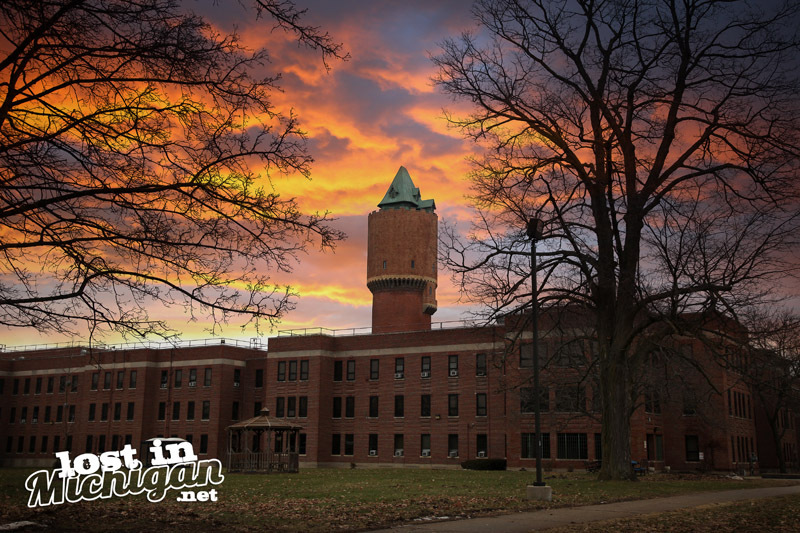 Standing in the center of the Kalamazoo Regional Psychiatric Hospital is an ornate brick water tower that looks like it’s out of a fairy tale as if Rapunzel is going to let out her long golden hair out one of the windows. 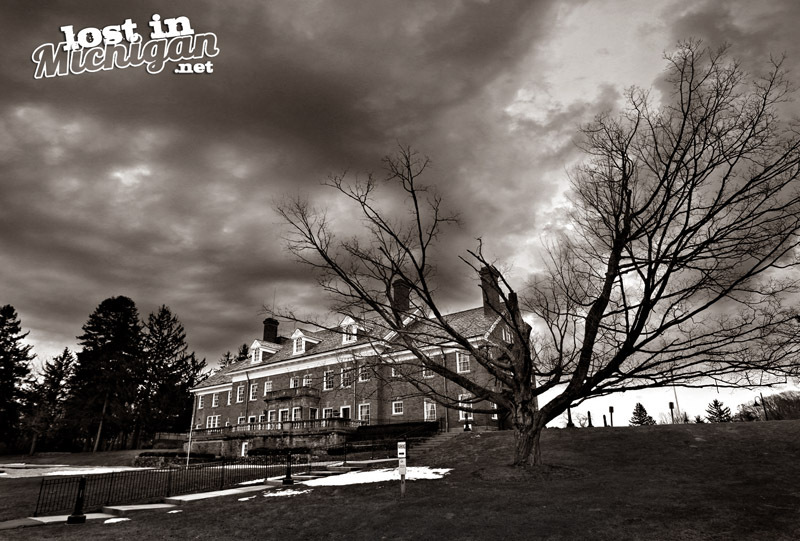 The hospital is no fairy tale of a place and was one of the largest hospitals of its kind when it opened as the Michigan Asylum For The Insane in 1859. To supply water to the hospital a water tower was constructed in 1895. To complement the feel of the hospital architect B. F. Stratton from Detroit was commissioned to design the water tower. The hospital changed names in 1911 to the Kalamazoo State Hospital and in 1978 it changed again to the Kalamazoo Regional Psychiatric Hospital. Like with any large psychiatric facility there are stories that go along with it to make you wonder if it is haunted. A doctor was stabbed to death by a patient in 1904 and a nurse was strangled to death when a patent lured her into the basement in 1954. I am not sure if there are any spirits still residing in the hospital, but I am sure that old water tower has bore witness to many things good and bad as it stands tall looking over Kalamazoo and the old hospital. Posted on October 9, 2017 by Mike Sonnenberg Posted in Haunted Places	. John A. Lau immigrated from Germany to Alpena where he and his wife Agnes opened a saloon in the late 1800’s. Lumberjacks and sailors would stop by the saloon in the “Old Town” district of Alpena, I imagine back then it was the “New Town” part of Alpena. For years the couple ran the saloon, then in 1913, Agnes died. There is no record of how she died, but rumors have said she died in childbirth some said she had Tuberculosis and there is a myth that she died in a boating accident near Saginaw. Regardless of how she died, it is believed her spirit still resides in the old historic saloon. A woman’s ghost wearing a Victorian style dress has been seen climbing the stairs. Workers in the bar said she has been known to tip over trays and playing pranks in the cellar by moving objects around or dropping things on the floor. 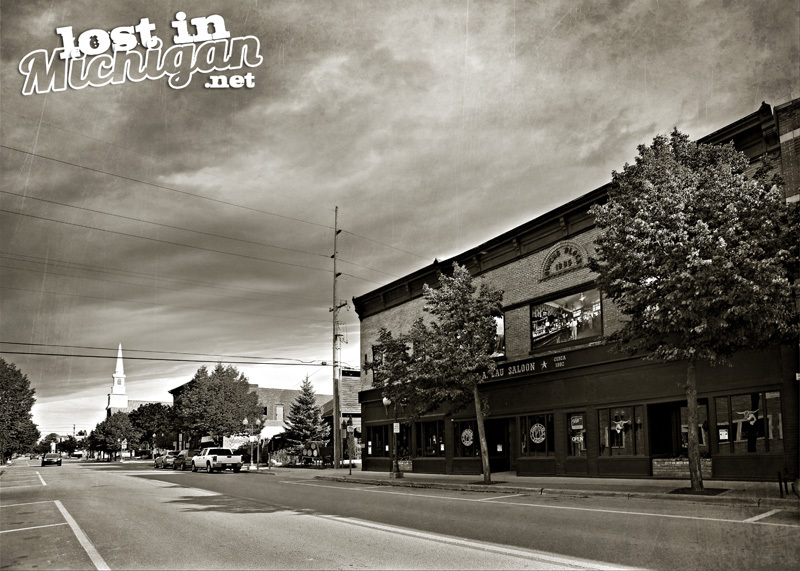 If you’re in Alpena, and you want a place to get a drink stop by the historic John A. Lau Saloon and you may see a spirit while your drinking you’re spirits. 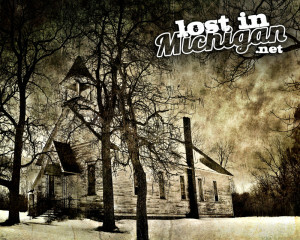 You can read about other interesting places in my Lost In Michigan books available HERE. Posted on February 16, 2017 by Mike Sonnenberg Posted in Haunted Places, Historic Places, Houses	. Six weeks after Dorr E. Felt and his family moved into the completed mansion in 1928 near Holland, his wife Agnes suddenly died. A year and a half later Mr. Felt died never having much time to enjoy their magnificent new home. Some believe their spirits still haunt the 25 rooms. Posted on January 12, 2017 by Mike Sonnenberg Posted in Churches, Haunted Places, Murders	. 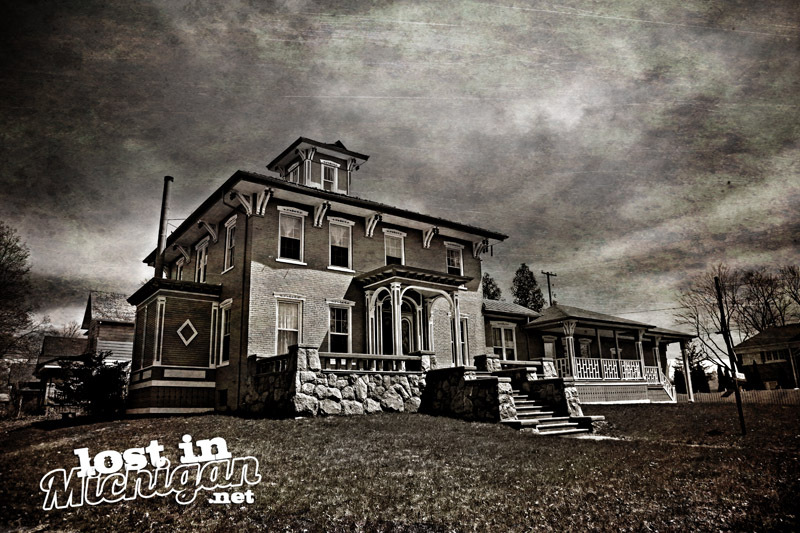 The long forgotten town of Rattle Run, and the church that the townsfolk once worshiped inside, has been gone for a long time, but one of Michigan’s most gruesome murders took place there. The town, named after the nearby rattling rapids of Columbus Creek, was located in Columbia township southwest of Port Huron. In January of 1909 the church caretaker made a shocking discovery of blood in the snow. When he looked inside the the church, it was in complete disarray, and there was blood splattered everywhere. 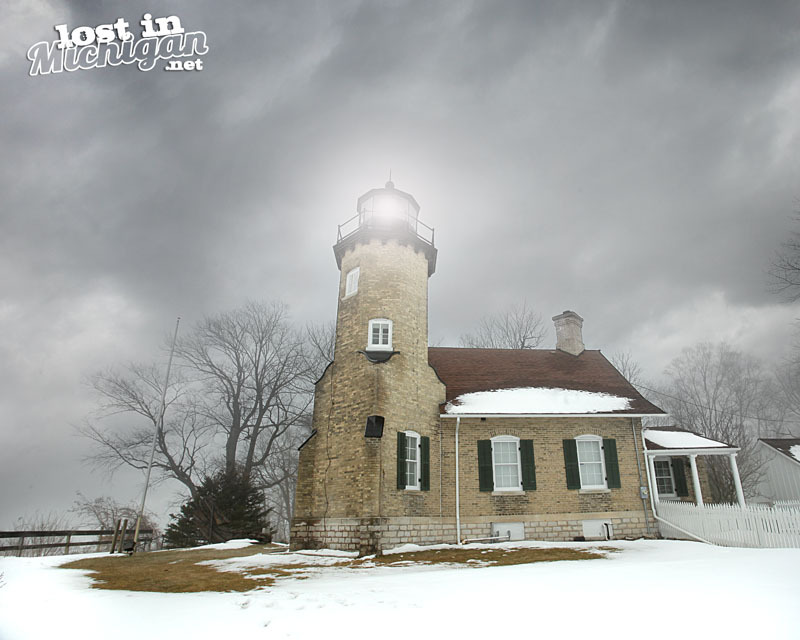 The caretaker contacted sheriff Waggensell in Port Huron, and upon investigating the scene, human body parts were found in the wood stove used to heat the church. The minister at the church, Rev. John Haviland Carmichael was nowhere to be found. The Rattle Run church is gone but I like this old abandoned church so I am posting this pic with the story. A few days after the murder, a man by the name of John Elder shows up in the town of Carthage Illinois without any baggage and rented a room at a boarding house run by Mrs. Hughes. He tells her he is a cabinet maker passing thru town. Mr. Elder was acting very strangely, and when Mrs. Hughes gives him dinner, he said he is fasting and would not eat anything. The next morning she made him a large breakfast figuring he would be hungry but he simply gathered what little he had, paid his bill, and said he was leaving for a job twelve miles away. A few moments later, she heard a noise in the shed and was scared to look for herself, so she called a neighbor but they were not home, then a mailman walked by and when he looked in the shed he found Mr. Elder lying on the floor with blood gushing out of his neck, and a knife in his hands. He was still alive, but died shortly after. The local sheriff in Carthage found two letters, one addressed to Mrs. Carmichael in Rattle Run and the other to Sheriff Waggensell in Port Huron. At first he said:” It’s all right, elder, don’t be afraid”. Then he began to talk about how we two could get rich. Three times he came to the rear of my barn and talked to me. Twice he was at the river when I went to water my stock, and each time I felt that he was doing something he was proud of. Once when I was going out to Columbus he was on the pike, near the pink school-house, when I overtook him, he asked to ride, which I could not refuse. he asked me if ever I had driven the pike to Port Huron, to which I answered no. Then he said: ‘Come on, lets drive up to Port Huron,’ which I resented, but he kept on until he persuaded me to go. He got out and stood at the corner while I went to the barn with the rig. Then later we had been at the restaurant, for which he paid, also for the horse feed, He gave me a half dollar and said he wanted me to go there and buy a small hatchet for his boy to play with. I began to tell him to go and do his own buying, he set his eyes upon me with the queerest sort of a look, something like a look of a snake’s eye. All the while I felt his influence tighten on my mind, so I went. Intending to go into the store and out the back way to get the horse and rush off for home. When I turned to close the door he stood looking upon me through the window and I just bought the hatchet and came out again, but by that time he had disappeared, I went into the barn, got my rig, and started for home, when as I made the turn into Military street he was at the corner to get in. He rode as far as South Park, where he got out to take the car, and he took the hatchet with him and said nothing, nor did I think anything at the time about it. When at the depot at Adair, he came out of the house and compelled me to walk the rails. All the while I felt as small as a bantam chicken. When he arranged with me about the wedding he wanted, he would go to Port Huron and get the license and meet me on the road between that place and the church. I thought that he really meant to get married when he engaged my services, but when we met In the road and he was alone I began to feel uneasy, but he said it was all right, the others would come in a carriage. When we went Into tho church I wanted to light a lamp, to which he dissented, saying; “No, elder, no light unless they should come”. But, presently, he said “maybe we better have a little fire”. So I went out and passed wood to him through the window. When I had put in what I thought would be enough, he said: “now, elder, the moonlight is Shining right on the front-door, and if you go around there to come in some one may see you. Just pile up some wood here and come in through this window.’ I brought a few sticks and laid them across each other, from the top of which he helped me into the building. he let the window nearly down again and we kept looking out through the opening to see if the others came down the state road. “Well, elder, I Just wanted to have a little fun. You consider yourself an educated man and look down on a poor Ignorant fellow like me, and I just thought I would show you. I knowed if I could handle you I could handle other men and make a big thing out of it. Now if I say, raise your hand, up she goes. See, that is no dream,’ and I felt my hand raising without any effort whatever on my part. “Then he said: If I say let down your hand. down it goes.’ and I felt it going down In. a singular manner. By this time I was so alarmed that I was in a cold sweat. I then leaned over to see if any one might be on the road, when he began to laugh again, and I saw that he was holding a weapon up his sleeve. Instantly I made a grab for it and got the hatchet from him and asked what he meant to do with that, and he said: “ I will show you.”and from his overcoat pocket he drew out a knife with each hand. He came at me. striking with both hands. I backed across the church, down the side aisle and across the front, but I did not dare to turn about to the front door. Then I threw the hatchet and struck him and he fell. I then turned to open the door, when he grabbed me by the leg and threw me down where my hand came upon the hatchet. There was a desperate struggle. in which I used the hatchet until he lay quiet and still. I cannot recal all that happened after that. I was wild to dispose of the body. I was in a horrible terror, I began pulling off his garments that I might drag the body away somewhere and hide it. when he woke up and grabbed me again. Then for a while I used that hatchet until I was sure he was dead. I waited until I saw the Fire was hot enough to make a stove pipe red nearly to the elbow I grabbed him and dragged him down there and began cutting him to pieces, putting in each piece as it was dismembered. Then I began to put the garments into the stove. Then I saw that my clothing was cut and bloody while some of his was yet whole and I exchanged them and then took all the bloody clothes and piled them in along with the body. My big coat hid my torn and bloody cloths until I got to Chicago, where I purchased others. I am tired of trying to hide. though I have succeeded in eluding the detectives so far. If you get this and l am yet alive, come and get me. I shall be not far from Carthage Illinois. Posted on October 29, 2016 by Mike Sonnenberg Posted in Cemetery, Haunted Places	. A friend of mine told me a story of an old native american legend about a half dog half wolf ( I always thought a dog was a wolf, but I digress) that roams the Omer Plains along the Rifle River, protecting the spirits of the native american warriors that have died and are buried in the Omer Plains. Maybe I am a little naive but I think many legends and stories start with a little bit of truth to them, and so I figured I would do a little research, Of course I went to where everyone goes looking for information, no not the library, or the encyclopedia, but Google. Searching for the old native american cemetery, I found the Plains Cemetery on google maps on Jose Road near Grove Road. On my recent trip up north, why not stop by and see what’t there. Heading north out of Standish I found Jose road, and traveled towards Omer, the biggest little city in Michigan, I stopped where Google said there was a cemetery. Maybe there was one there, but I did not see anything that looked like one, nor did I see the Witchy Wolf. A deer ran across the road which scared the bejesus out of me, good thing I was wearing my brown pants. I was there during the daytime. so maybe the Witchy Wolf only comes out at night.